Just down the street from the Leopold in the heart of downtown, you might notice a small sign for Allegro Strings. If you look further, down the stairs and peer in the windows, you’ll see a warmly lit room filled with violins, bows, books, and other ephemera. Look past that still and you’ll glimpse a small workshop, with clamps and chisels, planes and polish, perhaps a violin with no neck next to a freshly strung cello. 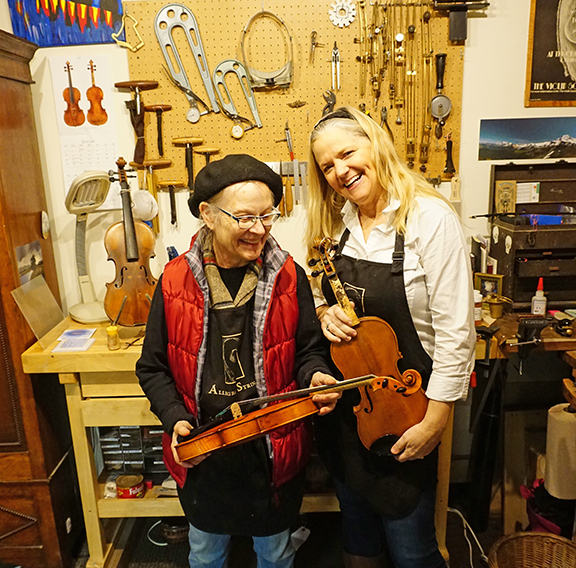 It is in here that you’ll find Dorothy Smith repairing and building violin family instruments for students and professionals alike. I got to sit with her and ask a few questions at last months Folk Fest. How did you get your start in the lutherie world? The simple answer is I was supposed to grow up to be a music teacher, but by the time I was about two-thirds of the way through I just really did not want to be a music teacher. I took my courage in hand and told my parents the best reason that I could come up with, that I was too short (laughs). I just couldn’t visualize myself, standing in front of a classroom, swinging my arms around. I started looking around to see how I could apply what makes me happy, musically, to the real world. And it took awhile, I was 25 by the time I really got it figured out and got my first apprenticeship. How did you make that transition? Who did you approach? It happened with a guy named Anton Smith who was one of the early graduates in the early 70s when there was this flux of people like, “Hey, let’s learn how to do real things.” He went to Mittenwald and studied, and came back to the states and was instrumental in starting the Salt Lake School of Violin Making. Then he got into an argument, like most luthiers, real headstrong and opinionated, and so he started his own school and I ended up there for about six months, and then he was off and running, bought a motorcycle and took off. I moved to Seattle and started working there, and I was totally bit by the (lutherie) bug and never looked back. How did you navigate being a woman entering a male dominated craft? I think I was in one of the first groups of women to get going in it. I started in 1980, and there was one other woman in my original class, so that was cool that I wasn’t the only one. It felt like one of the original boy’s clubs that I was breaking into. That was good and bad. I mean, some of them were just dicks, but for the most part people are just really great. This sort of work is so passionate, you either get it or you don’t, and when you’re on the passion wagon it doesn’t matter who you are. You’re just focused and you get to get together in a room with people who are focused on the same thing, and you’re all trying to learn it, and it’s really pretty exciting. And I also found it liberating being a woman in this field, because in many respects there weren’t a lot to follow, so I could just do whatever I wanted. I remember I was in Italy, I was like 30 years old, and at that point a 30 year old Italian woman doesn’t just go screaming down a set of stairs double time. You just don’t. But I had a cappuccino in one hand, a fiddle in the other, and I’m flying down these stairs in a pair of jeans, and I’m going “Girl, look at you!” (laughter). I could just kind of blaze my own trail. You currently have an apprentice, Lori. How is it having an apprentice in your shop? I’ve had people over the years, because people are drawn to it. And a lot of people have real good intentions, but either don’t have the eye-hand coordination, or just the persistence it takes to do it. When you hook up with the right person to be your apprentice, it’s just a joy, like with Lori who works with me now. She’s got this great background in art, and public relations with a non-profit for years, so she has all these little aspects that she brings to the table that make my life easier. In the past year she’s been with us she’s been learning to do all the basic repairs so she’s able to take over doing that sort of thing like keeping the rental stock going and the little day to day stuff that comes in. That gives me time to focus on bigger projects like building or a restoration that I wouldn’t have had the time to do otherwise. Are there any interesting projects you’ve worked on recently? This past year has been all about addressing projects that I never wanted to do. I reset a neck on a big upright bass, where the neck had been bolted in like 1970, and it had finally given. So off goes the top and I’m looking at the block and I realize that they’ve (previous “repairperson”) just totally messed the thing up, so the whole block had to be replaced. I had to chop all that out, grind the bolt out, and then I’ve got the neck in my hand, and that’s a lot of curves to keep track of. That was a big job, and then I just finished a neck graft. Then unfortunately somebody stepped on their bass, but I’m just about finished with that one now. Those are my three big projects this past year. And you also build instruments, right? I go into building phases. Two summers ago, I was just on a building bug. I built that violin over there, another one that’s finished and with its owner, and a third one that I’m finishing now, and two violas that are in the white (unvarnished). I haven’t really built since then, but I’m trying to clear my plate and get ready to build again. I’ve got some ideas that are forming up in here. Do you have a preference between building and repair? Oh, it’s a wonderful life. The world would be a better place if more people built instruments. Allegro Strings is located at 1210 Cornwall Ave., Bellingham. See www.allegrostrings.squarespace.com.